The title of this book comes from a poem by Taha Muhammad Ali, a Palestinian poet with a style so direct and immediate that the reader grasps that they are hearing something new and yet undeniably ancient at the same time: a viewpoint that eclipses the worn, the bombed-out, the broken. We are given fragments of, and context to, Taha’s poetry in this work, all showcased by Adina Hoffman’s careful, patient, gentle, and ferociously intelligent excavation and reconstruction of a meaningful life. It is an extraordinary act of witness. What can poetry do that bombs, bullets, and knives cannot? Adina Hoffman shows us in this biography of Taha, former resident of Saffuriyya, a Palestinian village with a long history of resistance against authority. Saffuriyya was bombed in 1948 by Israeli aircraft, and ever since the mere mention of the town carries the whiff of resistance. 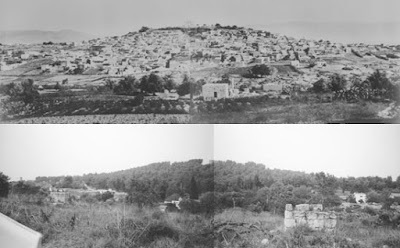 "Even before he could see the village, he has said, the scent of it was overpowering—the thyme and the mint and the lemon trees, the broom and the wheat and the olives. The thorns themselves seemed to smell sweetly there, and though he couldn’t say which perfume belonged to what plant—or explain how he knew the difference between the fragrance of a Nazareth sage bush and a sage bush with its roots in the soil of Saffuriyya—the boy was convinced that he could tell in his nose when he’d crossed the border, and as he made his way toward home through the basatin, as the orchards and vegetable gardens were known, the scents grew stronger and more complicated, more human. The fruit trees were everywhere, and at the Qasral spring he got a clean, cold whiff of the abundant water that made the village lands so rich (and, according to local lore, its people so strong-headed), then, getting closer, the smoky perfume of the cabbage, parsley, cauliflower, scallion, cucumber, and his favorite, mlukhiyyeh, the dark green mallow that his mother would chop fine or spread out to dry and that they would eat as a stew. Thinking of it would make him hungry and eager for the other scents to come: the way the garlic she fried before adding the leaves would blend and merge with the piercing aroma of the basil planted in clay pots before the nearby houses." Hoffman’s biography of Taha Muhammad Ali is resistance literature also: the quiet, unsensational accretion of fact and personal testimony, newspaper accounts, and the patient unpicking of tangled threads of disputed reports or repressive memory. What Hoffman has done indirectly is raise serious questions about race, identity, and belongingness, about nationality, statehood, and the nature of resistance. She places the poet Taha squarely in the events that influenced his creative consciousness: the creation of the state of Israel in 1948. "Saffuriyya was, let us say then, a 'village of murderers' in the sense it was a village with murderers in it. Saffuriyya was, however, also a village of tinsmiths—and shoemakers, shepherds, teachers, teething babies, laborers, shopkeepers, new brides, barbers, folk poets, gravediggers, carpenters, landowners, teenaged boys, builders, dyers, musicians, butchers, tailors, traveling salesmen, knife-sharpeners, old women, and a wandering ice-cream vendor who would appear on holidays and sell the children melting half-piaster scoops of their favorite flavor—chocolate, vanilla, or mint. It was a village of brilliant talkers, blubbering idiots, fat grocers, thin imams, of a kind Italian nun named Georgina, a fez-wearing Egyptian male nurse known as Sheikh ‘Umar, and Abu Qasim the peripatetic ritual circumciser, who never went anywhere without his black doctor’s bag and noisy motorcycle." So you see how Hoffman agrees with the official line and undercuts it in the same breath, how she forces us to acknowledge that we cannot paint a people with a broad brush. When the Israelis came, after they bombed the village in 1948, they found Stone Age olive jugs and oil jars in the ramshackle houses—could this be the same population they believed had no culture? A difference of perception combined with a will of steel might break what bombs cannot, and while many individuals have fallen, the Palestinian consciousness remains. In fact, its art may be a product of the half-century of oppression. In this week's (Nov 29, 2015) NYT Book Review is a discussion of the complete works of the Jewish writer Primo Levi, who claims he may have never written anything without his experience in Auschwitz, another example of how constraints often inform and beget an insurgent art. But Levi also believed, in the words of reviewer Edward Mendelson, that "the core of Nazi barbarism...was its reduction of human beings to anonymous things, mere instances of a collective category--Jews [or Palestinians?] for example--that can be slaughtered collectively because they have no individual value. The core of Levi's [and Hoffman's] science...[is] the refusal of generalizations and theories that transcend the realities of particular things." 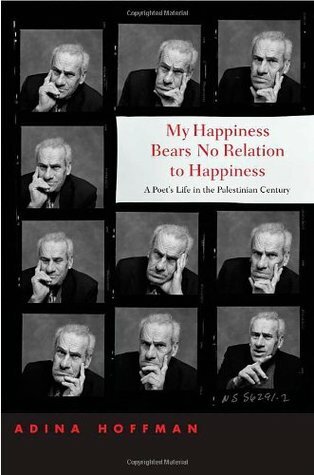 In her biography of Taha Muhammad Ali, Hoffman often asks us to distinguish between the thoughts and actions and poetry of Taha and his fellow poets from Palestine, between the peasant Taha and his better-heeled, or more radical and lesser-educated compatriots. By the strength of her writing, Hoffman is showing us how to unmask, and nurture an understanding of, the individual within the collective. Hers is a work of extraordinary power. "That many of the Jewish state’s new and future immigrants had just suffered the torments of the Holocaust at the hands of European Christians did not, to Palestinian minds, explain why they themselves were being asked to forfeit their hold on vast tracts of citrus groves and fields of grain, to give up direct access to the Red Sea and to the port at Jaffa, or to become—as 40 percent of the Palestinians suddenly would—members of a minority in a Jewish state." Now Saffuriyya is forested and has been designated a National Park in the Israeli state. Displaced Palestinians have never given up agitation to return to those lands, that village. “The most important thing was that there were no leaders, no intellectual leaders to explain what was happening and what we had to do.” This has ever been, to my mind, the “problem of Palestine” but also Israel’s problem. Lack of enlightened leadership is the region’s greatest failing. When we finally see Taha's poetry reprinted, the effect of it is amplified by the quiet industriousness and skill with which Hoffman prepared us. Hoffman’s work is so hushed and intimate we have the sense that we are sharing a conversation with a deeply humane independent thinker of enormous gifts and fine discrimination. The exquisite care Adina Hoffman and her husband, the poet and translator Peter Cole, took in both translating and publishing the work of Palestinian peasant and poet Taha Muhammad Ali, and then in picking apart the knotty strands of his life to show the creation of Taha’s particular genius, is everywhere evident in this unique work of biography. Matt Parker is a comedian who does stand-up math. Or he is a mathematician doing stand-up comedy…I forget which lifestyle definition attracted me to his routines on YouTube: some are complicated enough to make you forget to laugh…unless, that is, you are already in on the math basics he is sharing. I learned about Parker’s new book from the mathematician Ben Babcock, whose website reviews recently-published science fiction, among other things. 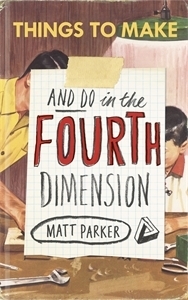 I was impressed with his assessment that “this is DIY math at its finest”-- impressed enough, after looking at it myself, to buy copies for my teenaged nephews. Besides that, in the YouTube clip I saw, Parker is wearing maths paraphernalia like a “smooth geometric t-shirt” sold by DESIGNBYHÜMANS that is über-cool for mathheads. I like to encourage thinking and innovation of any kind. Parker doesn’t neglect important relevant applications of mathematics: how to cut a pizza equally with crust or without, how best to keep your headphone wires from tangling, how to tie your shoes (!) the maths way…in other words, ways to learn and test math principles using everyday objects…or your classroom full of students. It actually does sound fun, which I guess is the point. Babcock makes it clear that one really understands maths by doing math, which is perhaps even more to the point. Below is a clip of one of Parker's routines. This short handbook can be read in an evening. It really is hand-sized, fitting in the palm. The language in it is so clear, it could be written for a non-English speaker or a school child. It was published in 2007. This subject is so fraught with emotion and intention it is difficult to just get the facts. In fact, this conflict may be the perfect place to begin to understand how "facts" are slippery things. Bennis has an opinion, but she is very good at tamping down the rhetoric and writing quietly. If you have read any of Bennis’ other works, you will find she tries to answer the most pressing questions people have first. That is, she will try to simply explain why there is fighting, or why suicide bombers appear on only side in the conflict. Her answers will raise more questions, which she tries to answer by going broader in the region and deeper into history. It is an organic method of setting out the issues and has the value of always providing at least a partial answer before we become overloaded with detail. The added benefit is that the questions can be listed, as they are in her handbook, as the Table of Contents. Bennis’ work is an important addition to the material one will need to read to get some measure of the size and depth and rightness of the Israeli-Palestinian conflict. It’s almost seventy years since Israel was founded. The generation involved in the creation of Israel is dead now. The generation that came after, that built Israel, is nearly gone. We can make judgments now about what those first generations have left us. Bennis herself is an American Jew. In her youth she was a Zionist, until she actually began to see what happened, what was happening, in the area of land now called Israel. To her credit, she could tell that what she’d learned, and what she was hearing, did not correspond to what she could see with her eyes. When she investigated, she discovered she could make up her own mind about the conflict. Her discussion on C-Span about the origins of ISIS includes, towards the end, a discussion of how she came to see the Israeli-Palestinian conflict. Here is a two-minute clip from that longer piece explaining how she got to her current path. Some people may not like the facts, and some people may like to put their own gloss on the facts, but if we just look at the facts, and the situation on the ground in Israel and (what as yet is not quite) the promised Palestine, I think everyone would agree there is something seriously amiss here. What the Israelis are doing is illegal. It is immoral, too, but lots of people do immoral things and we can’t stop them. The International Court of Justice in the Hague, however, ruled in 2003 that the Wall Israel constructed in the West Bank ostensibly for its own protection beginning in 2002 is illegal. It cuts off fifteen percent of West Bank land from the West Bank and puts tens of thousands of Palestinians on the Israeli side of the Wall, among other things. Why hasn’t this been addressed in the 12 years since it was constructed? "The International Court…stated directly that other countries have their own responsibility to pressure Israel to comply with the court’s opinion…The US government quietly criticized the Wall early in its process of construction, but soon dropped the critique and agreed, in direct violation of the Court’s ruling on the obligation of other states, to pay Israel almost $50 million—taken out of the $200 million the US provided in humanitarian support to Palestinian NGOs—to construct checkpoints and gates in the Wall." Why aren’t we tying assistance to compliance with the law? I can’t figure it out. I know that wealthy Jewish donors in the US skew the political process by pressuring candidates to vote sympathetically to their issues by giving them generous campaign donations, and by buying up media sites that send out constant self-serving messages. Is it really that bald? Money? Power? Influence? Geez. Talk about a morality deficit. Since the history recounted in this short book, the United Nations has granted non-member observer state status on Palestine, and now allows the Palestinian flag to fly at the U.N. These steps were taken despite the U.S. and U.S. allies voting “no” on the resolutions. This book will tell you why this has happened. It is difficult for even a well-read American to separate truth from falsehood in the history we learned in school and from our own government these past sixty-odd years. We only hear the Israeli voice; Palestine has been almost erased, her people silenced. It takes real dedication for anyone to understand why, in the modern era, millions of people would be forced from their land with no compensation, and then, gradually, over time, lose rights to even the small amount of land they had left from their own holdings. I feel quite sure that things could have been handled differently at many turns over the years. I wonder how Israelis think their occupation of Palestinian land will end. Does their government think they are going to protect Israelis from harm by this method? Is this the way to live in the world? Americans can hardly claim the high road by their treatment of minority classes in their own country. I think we are seeing how that’s working out in real time. I am forming an opinion, and it is not what I learned growing up. When the ship goes down, I want to be in Murray’s skiff. At least there will be laughter, love, generosity, poetry, and with any luck, a gulp of whiskey among us. If you thought the financial meltdown and its aftermath was too complicated to understand, read Murray. His account is a little like that fabled whiskey, warming and clear. At the inevitable end, we wonder where our head was, to think we could carry on like that and not have a hangover. "[The restaurant called] Life is so loud, it takes a few moments to realize it is almost empty." Murray gives his reading audience almost everything we want in a modern novel: a little mystery, a little romance, a little grand larceny. He does not neglect important, relevant subjects like the isolation of lives wrapped in technological bubblewrap or the failure of the banking system to protect and build a middle class. His bright gaze reveals the cracks in individual and institutional facades. But it is all done with a lightness of touch that makes it clear we can understand this, that we must, in fact, understand this, if we are going to save ourselves. "If it’s a choice between a difficult truth and a simple lie, people will take the lie every time. Even if it kills them." A successful French banker, Claude Martingale, takes a job in Dublin to escape snorts of derision from his father over his choice of career. A blacksmith and former radical, his father was unreasonably proud when his son graduated college with a degree in philosophy. “Philosophy was France’s greatest export,” he would boast to neighbors. How then could his son side with the thieves and quants who knew only how to cut experience into saleable lots, “using the underlying only for what can be derived from it,” rather than understanding the real value of life, of experience itself? "Technology allows unprecedented quantities of reality to be turned into story. Reality becomes secondary…life becomes raw material for our own narratives." 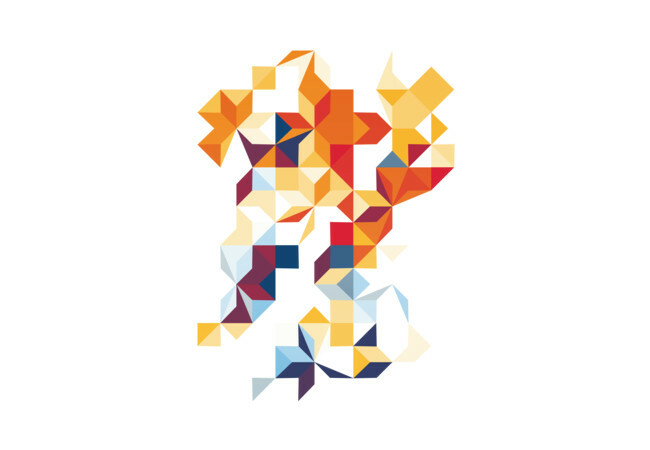 Claude’s investment bank in Dublin creates financial instruments that fictionalize reality. What better place to set a novel? The problem of trying to make interesting the life of a banker was the central struggle of this work, and the central lesson we are meant to take away. Claude’s life in the bank was soulless, but not without moments of excruciating drama. And there was money…lots and lots of money…for some. Murray warns us that members of society have a responsibility to call out the farce and refuse to play...or get them to pay. They need us, after all. But this insistence that we think comes to us with many examples of the fun part of thinking: madcap imaginings of a literary dinner, complete with a novelist camping up his meeting with his editor who, in his quest to sign the “next big thing,” appears strangely blinkered to the outrageous behaviors and opinions in his stable of authors. The reviewer who panned him (“I’m a little surprised she has flesh. I always pictured her as a sort of floating skull”) appears oblivious to the careers she has skewered. A slip of an editorial assistant captures everyone’s attention with her tremulous defense of art. Murray invites us to look at the lives of writers: the crazy cash-flow between a novel’s conception and publication, the procrastination, the wacky attempts to jump start the creative process, the whoring (literally, in this case) of life partners, the desperation and despair. And then the reviews: “TL, DR” (Too Long, Didn’t Read), or the cavalier online dismissal of the years of effort because “Wombat Willy” received the book late and got a papercut getting the book out of the box. 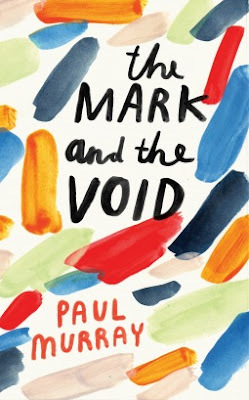 This is the first book I have read of Paul Murray’s since Skippy Dies, his magnificent second novel about the horrors of Irish Catholic public schools and just about everything else, including quantum physics, climate change, history, and music. I found myself relaxing into this new novel, enjoying the ride while harboring a nagging feeling that this is not Murray’s finest work. His talent, understanding, and deep sense of the absurd are undeniable. If I wish for more discipline, focus, and seriousness, will I have to give up the sheer joy in the unwieldy construction? Writers are who they are and do what they will do and thank goodness for it. I note, however, that Murray was hoping to write a short novel this time, which would imply his interest in a greater adherence to those other qualities of style. Perhaps we will get it one day. Murray has the goods, and lord knows I wouldn’t trade one of his laughs for its reverse, not in this world. Joy. One morning recently I awoke to hear Krista Tippett, host of the radio show On Being, conduct a rare interview with the poet Mary Oliver. 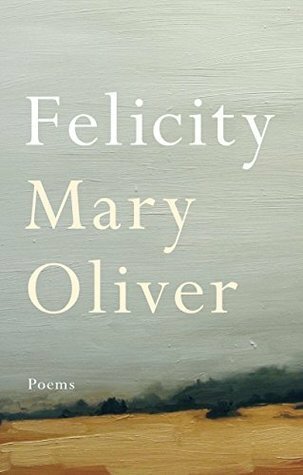 Oliver is now eighty years old , and has a new book of poetry called Felicity. The poems in it are shorter, overall, than those in her earlier work, and they have a gladness that seems fulfilled or nearly so. Oliver exhibits a passion for the world and a confidence that only the old and very aware among us can express. The collection called Felicity has one of the most beautiful covers I have seen in a very long time. It is a close up reproduction of an oil painting in which the brushstrokes and color variations can be seen: a large, seemingly infinite gray sky, a sliver of tan ground and a charcoal smudge in between for trees. We might even take the gray sky for an ocean in the distance, stretching out so far the horizon is not visible. No, wait, a lightening of the gray near the top of the painting--could it be a distant horizon? The depth and the beauty of the color gray stops our breath as we gaze, searching it for variation, for a clue, either of weather, or of substance. Oliver often writes about the natural world and how that informs her own experience in it. She lived for many years on Cape Cod, observing the seasons, the wild things, life and death. Gradually Oliver's work reflects a kind of peace, and faith. "If I have any secret stash of poems, anywhere, it might be about love, not anger," is a quote from Oliver on the cover of her new collection. She struggled to overcome lasting damage and in that struggle has produced great work and come through the other side. The horrors we face, the constraints under which we labor, could they be the very thing that incubates art? In the struggle to survive, some among us burst forth with great deeds, great literature, great music, or great art. That struggle makes us who we are. on the ground; ashamed, ashamed?" …I just listened, my pen in the air." he had a weapon in his hands. he could have been no more than twenty. Mary Oliver made me cry when I read a poem in her latest book, but whether it was tears of sadness or of joy, I do not know. To have someone observe, and then speak with equal beauty of such a thing is a gift to us. Ideas, language, even the phrase 'each other' doesn’t make any sense." Here Coleman Barks talks about Rumi’s idea of love, that Mary Oliver so admires and embodies in her work. I have an aunt, a native New Englander transplanted south, who sounds so close to Mary Oliver's voice, philosophy, lifestyle it could have been my aunt speaking. Both women answer "What is the gift I should bring to the world?" in a way that has made us richer. "What we should be doing is make a moral planet." A friend introduced me to the reviews of Adina Hoffman in the The Nation, in which she discusses the work of Olivia Manning. Hoffman has the most exquisite sensibility toward the conflicts in the Levant that one ignores her opinion only at their own loss. "one Middle Eastern, mostly middle-class Jewish community’s detritus—its letters and poems, its wills and marriage contracts, its bills of lading and writs of divorce, its prayers, prescriptions, trousseau lists, Bibles, money orders, amulets, court depositions, ship inventories, rabbinic responsa, contracts, leases, magic charms, and receipts. 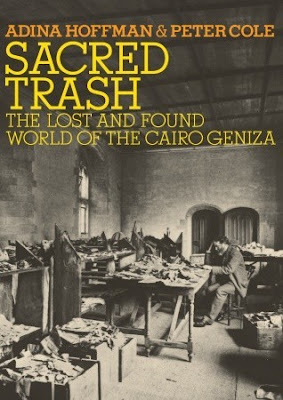 …For reasons that remain obscure, in the case of the Palestinian Jews of Fustat, of Old Cairo—who worshipped in what would eventually become known as the Ben Ezra synagogue—the tradition of geniza was, it seems, extended to include the preservation of anything written in Hebrew letters, not only religious documents, and not just in the Hebrew language. Perhaps, as one scholar has proposed, 'the very employment of the Hebrew script…sanctified written material.' Another theory holds that the Jews of this community may simply have piled up papers in their homes and periodically delivered whole cartfuls to the Geniza without bothering to separate sacred from secular writing. Or maybe, as another writer has suggested—in an effort to make sense of the hodgepodge of texts that have turned up in the Fustat Geniza—the impulse to guard the written word may have gone beyond piety and evolved into a 'generalized aversion toward casually discarding texts of any kind.' Whatever the explanation, for most of the last millennium, hundreds of thousands of scraps were tossed into the Ben Ezra Geniza, which came to serve as a kind of holy junk heap." Hoffman and Cole tell the story of how the cache of documents was found and what happened to it after that. They introduce us to the "active imaginations" of several people who could see what riches the cache held, as well as those who wanted to use the documents for their own personal aggrandizement. But mostly it is the chatty story of thrilling discoveries and talented scholars who were able to realize what they held. In 1999 the Toronto currency trader and avid bibliophile Albert Freidberg established a non profit whose aim to to inventory and digitize every Geniza scrap in existence. Eventually full-color photographs of the documents will be available on the Friedberg website. In the final pages Hoffman and Cole write that rummaging in the Cairo Geniza is not unlike rummaging in the attic of history. They pay tribute to the scholars who take on the work of realizing the value of the documents for us today. "…We’ve known all along that we’d find things that some would consider rubbish and others treasure. This, though, is what literature does, what writers do—and when it comes to it, what faith is. And as this book makes clear, it is also what the scholars of the Geniza have done, in a quietly heroic way, for more than a century now. If, with Cynthia Ozick, we think of history as ‘what we make from memory,’ then these scholars have quite literally be making history by re-remembering it, by putting it back together syllable by syllable under the intense pressure of powerfully informed and at times visionary imaginations." 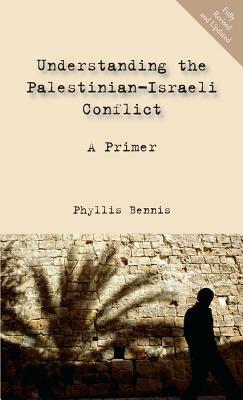 Phyllis Bennis is a keenly aware and thoroughly informed policy analyst whose knowledge and anti-war viewpoint adds depth and insight to our understanding of U.S. international relations and the ongoing conflicts in the Middle East. I was introduced to her work through an interview with her shown on C-Span. Her point of view is an important one to consider when contemplating any kind of intervention overseas. What she does in this wonderfully concise primer on ISIS and the war in Syria is clearly outline the steps that led us to our current position, pointing out opportunities we could have [should have] made different choices in our involvement in the region. Bennis sheds light on angles of the conflict I had not considered, putting the information together in a way that highlights possible motivations that are at odds with stated government ideals, oil and guns being the most clearly outlined in her spotlight. I had not realized, for instance, that the low price of oil was a motivating factor for Russia and Middle East countries and their involvement in the Syrian crisis, or that Saudi Arabia was trying to pressure Putin to abandon support for the Assad regime by using its own position of dominance in the oil market. Added to her analysis, however, are scattered digs at U.S. policy that are arguable: the U.S. launched “a few” airstrikes against ISIS around Kobane [Syria] and “eventually” persuaded Turkey to allow a few carefully vetted units of the Peshmerga to cross the border from Iraq to help defend the city. U.S. Secretary of State John Kerry at the time stressed U.S. efforts were focused on bringing a coalition to the table to rebuild the morale and capacity of the Iraqi army…not focusing the plight of Kurdish civilians in Syria. Some folks may think it lamentable that we cannot, like god, manage all things all the time. Bennis’ snide comments about what we were trying to manage rather than what we were not diminishes her argument, especially in the case of using bombs to protect. Towards the end of the book, Bennis makes her case for nonviolent responses to aggression, using instead diplomatic and economic tools to tame the enemies of peace. This is a direction I have been mulling over for some time, and was disappointed to read such ideas are consistently rejected at the highest levels, perhaps because there appears to be no cadre of people within the government willing to speak against the current ethos. The U.S. can be said to lead in this way at least: countries around the world are distrustful of each other’s motives, especially those whose smaller economies make them pawns in the hands of the behemoths. Bennis’ method has the advantage of being very clear: no U.S. aid, trade, money, or weapons to those who violate the rights of their citizens and/or the sovereignty of other countries. I quite like the idea, though it would mean that arms dealers and other companies would have to actually work to the benefit of our nation rather than the other way around. It is no good being cynical since it serves no one. It has taken a great deal of violent death to bring us to the point where we can admit that bombing ISIS seems only to spread the contagion of a medieval world view. One has to think about what might work. Military efforts, no matter what kind of precision weapons we use, are a very crude and wasteful way to solve problems. I am concerned that the U.S. somehow thinks itself blameless in the aggression we are experiencing now. Perhaps it is time to incorporate a new approach. • The U.S.-instigated Sunni Awakening plan in Iraq was to pay Sunni outliers to fight with, rather than against, the occupation and U.S.-backed government in Iraq. About that time Al Qaeda in Iraq (AQI) changed its name to Islamic State of Iraq (ISI). When the U.S. government was being withdrawn, responsibility for payments to Sunni leaders was passed to the Iraqi government, which did not continue the practice. Sunni leaders became restless, often eventually defecting to ISI, renamed ISIS after its emergence in Syria in 2011. • ISIS is using grotesque murders posted on the internet to outrage and thus lure Western governments into war in the Middle East, thus spurring recruitment for their resistance. • It is important to recognize the breath of public support and involvement in the Arab Spring uprisings. Media coverage focused on blue jeaned young people posting on Facebook via cellphone, but the bulk of the movement was broadly-based not-entirely-secular workers, rural residents, older people motivated at least partly by faith. • The Arab Spring movement in Syria began as a nonviolent protest with the recognition that once the movement takes up arms, the moral legitimacy and wide base of mass support would be lost. Bennis reprints statements issued at the time which shows the reluctance of such groups to accept American airstrikes in retaliation for chemical attacks, knowing that civilians would be the most affected once again. 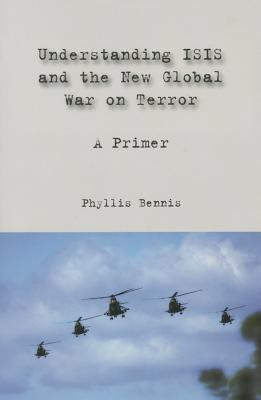 • Bennis credits Graeme Wood writing in the Atlantic for pointing out that ISIS attached great significance to their capture of the Syrian city of Dabiq, near Aleppo. The Prophet reportedly said the armies of Rome will set up camp in Dabiq and the armies of Islam will meet them there and the crusader armies will burn. ISIS wants to provoke an attack by its enemies on its own turf. Judging by what we are hearing from the Republican candidates for the presidency, it seems to be working. 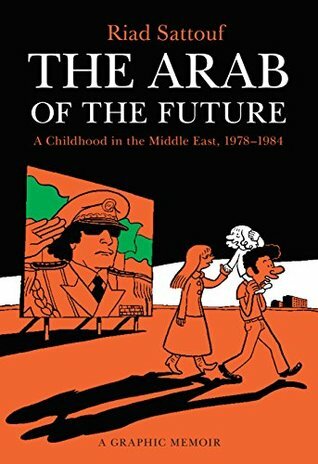 This memoir in the form of a graphic novel by Riad Sattouf is positively terrifying. It only takes an evening to read, and I can guarantee you will not want to put it down. A cartoonist and former contributor to Charlie Hebdo, Sattouf now has a weekly column in France’s L’Obs. This graphic memoir is translated from the French by Sam Taylor and published in 2015 by Metropolitan Books, and tells of Sattouf’s early childhood in France, Libya, and Syria. The memoir is terrifying for what it tells us of the consciousness of a Sunni Arab man and his extended family, as well as the conditions in the late 1970s-early 80's in the cities of Tripoli and Homs. Sattouf engages our sympathies immediately by starting out his descriptions from the eyes of a blond two-year-old, who we might expect to be perplexed wherever he was, being new to the world. But this turns out to be the perfect vehicle for presenting the things he sees, hears, smells, and experiences with a disingenuous honesty, though, I must admit, the consciousness of a child. It is as disarming as it is damning. We laugh and cringe at the same time. Sattouf is choosing what to tell us about his upbringing with the consciousness of an adult. He shows the peculiarities of early education in France, and Syria. Both have failures, as a system. It’s a wonder we survive at all, but less surprising that we exhibit the flaws we do. He has a finely honed skill for cutting away the extraneous, and revealing the kernel of his experience. He makes it laughable, but at heart, it is also terrifying. Riad’s Syrian father, Abdul-Razak, is the first of his family to read and is (therefore?) considered a great scholar in Syria. He is sent to study history at the Sorbonne and manages to wed an unworldly French student, Clementine, who is studying in Paris. Clementine is from a small village in Brittany and when they both graduate, Abdul-Razak accepts a position teaching in Tripoli, Libya. You have got to read this to enjoy it. I don’t want to spoil your fun. It sounds just about what you might expect with Qaddafi in charge, only even worse than you could imagine. The family returns briefly to France, and then pack themselves off to Abdul-Razak’s home village outside of Homs, Syria. By this time Riad has a new dark-haired brother, but his own hair is still blond. He is teased (and beaten up) mercilessly in Homs, where the children harass him with expletives while calling him “Jew.” Conditions of everyday life in late 70's Syria sound positively crushing in this period Hafez al-Assad, Bashar al-Assad’s father, was in charge. Riad’s family was Sunni; Assad was Alawhite. Segregation by religion, by sect shouldn’t surprise me, but the extent and result of it is stomach-roiling. Riad’s dear father, Abdul-Razak doesn’t sound more enlightened, for all his education. I am reminded of Richard Dawkins’ The God Delusion in which he writes that early childhood inculcation into any religion is one of the most damaging things that can happen to the impressionable mind. One cannot help but agree when one sees what it has done in cultures all over the world. In this part of the world hatreds last for millennia, perhaps due largely to childhood inculcation of religious ideology. Riad’s father buys him a plastic revolver as a toy. “All boys like weapons,” he says. Does it follow, I wonder, that all who like weapons are still boys? What Riad captures in this work is the deeply ingrained and insufficiently informed nature of the racism and sectarianism in each of the countries in which he has lived. He also captures realistically grim pictures of living conditions in each country, as well as the good bits: in France, we see an education system that seems to work well for enrollees; in Libya, we see ancient ruins by the sea that evoke history better than many other ruins; in Syria, we see the memories of a school-aged Abdul-Razak bring him back to a simple life. But each is a comfortable deception that people feel comfortable telling themselves. Family ties were more important than whether your relatives were good people or not, and obligation takes the place of generosity. Riad’s drawing skill is such that one can envision the environment quite clearly. It is better than a photograph since Riad can add the elements he wishes to emphasize. In the New York Times review of this title, as well as The New Yorker 10/19/15 review, called "Drawing Blood, we learn that Riad has a few more installments planned for this series, and I look forward eagerly to other adventures as he grows older. He has a viewpoint that is not all sarcasm. He so far has spared his mother, who comes across as a bewildered alien in a hostile environment. Riad’s work has the sting of criticism, but since he presents it through the eyes of a child, adult readers are meant to add their own gloss, knowing what we do about the perceptions of a child. Let’s see what he comes up with next, enjoying this and making up our minds later about whether he oversteps the mark. This book so weighed on me that I couldn’t finish it the first time, so began again recently, to refresh his points in my mind. One might think I was depressed to hear his hypothesis, that there can be no God, but frankly, it was not that. I have tended to think in his direction for many years now. More, it was his description of the profound hatred those who profess religion exhibit towards others outside their sect. It is stomach-churning to hear the vitriol harbored by folks who believe themselves “chosen,” no matter which religion it is that believes itself the one, true religion. It is enough to make one despair of humans. Humans should challenge their beliefs frequently to make sure they are not just spouting rote learning. We have brains capable of thought, so we should at least try to work it out. Why say, "these are things I cannot understand?" In that case, we would have more humility and doubt about our beliefs than the certainty too many exhibit. When one does the “homework,” one will turn in one’s mind many of Dawkins’ arguments, and his work will feel familiar, simple, and clear at first. The thing Dawkins does for which I am grateful is that he takes all baby steps that a questing individual must take, buttressing his points with work from those who have walked this questing path before as well as giving us sometimes amusing, sometimes heartbreaking examples of those who have not challenged received wisdom and who adhere violently to things they admit they do not understand but merely believe. Years ago I read the Bible. A couple of things hit me: the source of much that is memorable in our literature is referenced from the Bible; The Old Testament documents revoltingly violent and cruel behaviors; both testaments are filled with superstitions and magic (call them miracles if you prefer) and stress the importance of faith over the evidence of our own experience. That’s why Dawkins’ examples roll off the backs of Christians. They were taught to distrust evidence and believe. The kindness and magnanimity taught in the New Testament did not take as well, clearly. Why? That is much harder to pull off than “not thinking.” Yes, I think many self-professed Christians are lazy. They are “saved” by virtue of “accepting God.” Why bother with goodness? But all they need to do is “confess” and they are forgiven. Again, why bother with goodness? You can say that is not what God intended, but what does that matter? it is how he is practiced. How can we evolve (read: improve, for those who rankle at the thought of evolution) if we do not challenge accepted wisdom? Many of us learned religion as children, when we were accepting the teachings given us by adults, presumably wiser. By the time we reach our teens most of us have discovered wide disparities between the reality we experience and what we were told by adults. We begin to question. It is only much later that we can piece together our own beliefs. This should include religion since it is one of the more mysterious and irrational of our belief systems. It is always wise to check now and again what we believe when it comes to religion, especially now, in a time when the religious beliefs of others are once again threatening all we hold dear. Surely this hostility is amoral. While I myself learned the beginnings of moral thought in a Catholic environment, I also learned many other questionable behaviors from the nuns, amongst them that creativity is not prized. Dawkins points out that morality and goodness can be taught outside of the constraints of religion. But somehow this seemed the least strong of his arguments: that “do not treat others as you would not like them to treat you” is good evolutionary behavior that will succeed where other behaviors will not. It seems amply clear to me that religious folk have a tendency to kill those who do not believe their brand of God, surely ending evolutionary advancement along those routes. It matters, I suppose, whether or not there is a God, though I still haven’t figured out why. 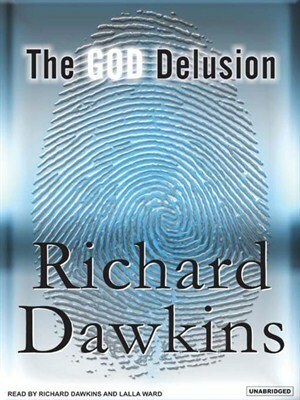 Truthfully, the first time I read Dawkins I put aside his book aside thinking, who cares whether or not there is a God? What difference does it make? God does not act in the world, or if He does, He is not orchestrating. That seems clear to me. So, if He exists, so what? We still have to get on with doing the best we can with what we have. Be moderate in all things but strive for goodness, kindness, generosity, creativity. It makes you live longer and feel better, and just in case, it may also be good evolutionary behavior. I listened to the AudioFile audio production of this title, for which AudioFile won its coveted Earphones Award when it came out in 2007. What makes this such a rewarding listening experience is that the two readers, Dawkins himself and his wife, the actress Lalla Ward, take turns with the reading. The two voices break the text into digestible bits and refresh our listening every couple sentences so that we concentrate on what is being said. This is difficult material which might evoke strong reactions or may tend to make the mind wander off in different directions. The two voices help to keep our mind on what is being said. That must demonstrate a bit of evolutionary learning right there. Anthony Marra’s new novel uses the format of interlocking stories woven into one narrative. His last novel, The Constellation of Vital Phenomena, was about residents of Chechnya fighting Russian soldiers. This, his second novel, captures those Russian fighters: we see who they are, why they are, what they do. We see their humanity, their crushable-ness, the love they have for one another. They know no more about Chechnya than they do about life outside their village. The stories are a feat of empathy. Marra takes us on a journey, but we feel we are coming home. We enter the lives of those who lived long ago: a censor for the Soviet State, a prima ballerina, a painter. We see the lives of those who came after: a movie star, a street thug, a father in the nickel mines of Siberia. Marra involves us in their lives and teaches us something new about an area of the world that we could never have known, wouldn’t have ever seen, even with travel. But it doesn’t feel distant or removed: it feels as though it could be us, there, in Siberia, in Chechnya. He does it with language: two young brothers joke with one another in a familiar way—familiar to us, too. Galina, the movie star, answers the phone “Who gave you this number?” trying, unsuccessfully, to keep her old life at bay. A handicapped soldier patiently explains the best time to expect generosity from passersby. We could be these characters, savvy, stupid, absurd, and yet somehow worthy. He does it with structure: Pieces of one person’s life turn out to the same piece of another person’s life. The stories have commonalities, a thread that disappears into the weft of a weave, a color (gray? green? leopard-skin?) that recurs. He does it with images: the photograph of the cancer-ridden wife of a dreamer and her two sons all dressed in leopard-skin bikinis by the pollution that was Lake Mercury, while smoke from the twelve apostles spews into the unchanging gray sky in the background; the mix tape of songs and voices that is carried in the shirt pocket or in the head like a talisman; a green hillside in Chechnya, perhaps the most enduring of the images, common to a nineteenth century painter, a censor, an archivist, a soldier, a brother. We are familiar, by the end, with the Siberian mining town--its pleasures and perils, with painting—airbrushing and restorations, with the life of a movie star, a gangster, a Soviet citizen. Imagination is what sustains us all. A word must be said about Marra’s language in this novel. He takes risks with his similes, reveling in the writing, and unfettered by fear: “…a man’s chin, with its deep dimple, looks like a small dog’s balls.” We know he can write solemnly, poignantly, about love and death, about criminality and chance. We also know he has a taste for the absurd in the brutality that can be life. Humor is a major factor in this book, for were it not so, none would survive. 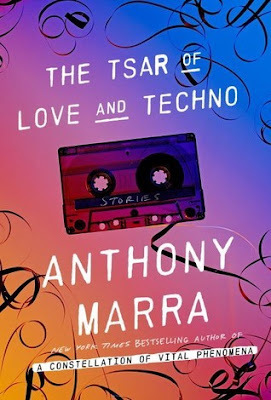 I listened to the mix tape of this novel, published by Random House Audio and read by Mark Bramhall, Beata Pozniak, and Rustam Kasymov. The voices are accented English, as though a Russian were reading English, and it is extraordinarily effective. A listener experiences familiar corny jokes in an unfamiliar inflection that warms us to the characters, and makes us feel at home and away at the same time. I wish all authors and publishers took as much care with the audio production as they obviously did with this one. Kudos to all.